Different people have different ways of preparing curd rice. I like this one the most. This is my aayi’s version. I used to run away from it when I was growing up. Now it is one of my comfort foods. Add green chilli pieces, coriander leaves, pepper powder and salt over the cooked rice. Heat ghee and add mustard, asafoetida, curry leaves to the heated ghee and add them to the rice. Add yogurt to the rice just before serving. Hey Shilpa, my granddad was a Kodkani too. Have visited the place once on the way to the mahamaya temple at Ankola. Enjoyed the blog. You should add more traditional receipies. Cheers Nitin. this can be made using left over rice too. add warm milk to rice and add a little curd(menayika) i.e to set the curd. let the curd set in the rice. season as usual. nice one shilpa…… i believe some people add some vegetables to it also….. like grated carrot or cucumber. This is one of the special rice item served in many temples in Andhra- especially in Tirumala (Sri Lord Venkateswara temple) & its called as “Dadojanam”. There they also add cashew to this. Kamats in Hyderabad and I guess other places in the south cook curd rice differently.They fry onions as well in the”Phodni” and then in the end put some tomatoes and pomegranates as well. TAstes really good. I stay in US. And I was supposed to take curd rice to one of the temples here for naivaidyam. I was little confused. But your recipe helped me a lot. Based on your procedure I made curd rice which came out perfectly well. Thanks for the wonderful recipe. Thanks a lot Amrutha. I am happy to know you liked it. Adding pieces of cucumber also tastes good. Hi Shilpa ….I happened to see the revisited section. Picture looks good. I follow the same as you do. In Mumbai i used to add a few pomegranate seeds sometimes. 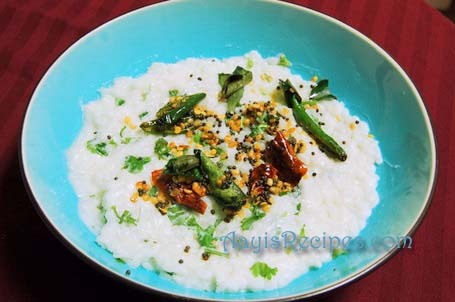 The best curd rice i ever had was from a restaurant called Purnima, he used to add finely chopped carrots and cucumber. When i have guests at home, who are fond of curd rice, then i add a few fried raisins and cashews and the tadka in ghee. this recipe is soooooo great and works when i’m feeling lazy to cook…. i also wanted to ask you do you have the recipe of carrot rice??? Your website is just awesome…. Can you please suggest few easy recipes for preparing for 2-3 trips for group of people say like chappati, curd rice etc? Seems you have tried far many recipes….. Would be happy to see them like lunch box menus…. Thanks Shilpa! I was going to make curd rice then I thought let me see how my friend Shilpa makes!!! When I was in Canada, we always made this when we embarked on a long drive and had it with pickle!!! I am staying in UAE,i have one doubt.For preparing curd rice whether to use Yoghurt or Leban.Yougurt is too much thick and leabn is little watery not like butter milk. Shilpa: I don’t know what is lebn. But if you are using yogurt, You can add a little water and thin it while mixing in rice. Thank u very much for the timely suggestion.Let me do the samethimg. Wow!!! Just perfect, simple easy to follow and real tasty. I made it yesterday made it today as well. Cant promise about tomorrow. To improve the protein content of the meal I added Soya Granules. It went well along with Curd rice. Adding Chana dal broken fired cashew nuts also improved the protein content along with imparting crunchy texture to the meal. Thanks so much for such a wonderful website!! Keep up the good work! u can add pomegranate seeds…it wil b colorful as wel as more tasty !